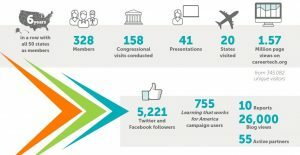 Advance CTE is excited to release our 2016 Annual Report, sharing our major accomplishments, partnerships and initiatives from the last year. There’s no question 2016 was an incredible year for the field and for our organization! In partnership with the Council of Chief State School Officers and Education Strategy Group, and with support from JPMorgan Chase & Co., launching the New Skills for Youth initiative. The U.S. House of Representatives passing a bill reauthorizing The Carl D. Perkins Career and Technical Education Act. Advance CTE directly engaging our members in all 50 states through our events, technical assistance and resources. We hope you enjoy reading about Advance CTE’s major accomplishments of 2016, none of which could have been possible without our members, partners and the greater CTE community! This entry was posted on Wednesday, February 15th, 2017 at 10:07 am	and is filed under Advance CTE Announcements, Advance CTE Resources. You can follow any responses to this entry through the RSS 2.0 feed. Both comments and pings are currently closed.